Hey, everyone. We have two bits of news for you today. One is about Zero Radius Games' Pillars of Eternity card game and the other is about updates for the DVD copies of the game. 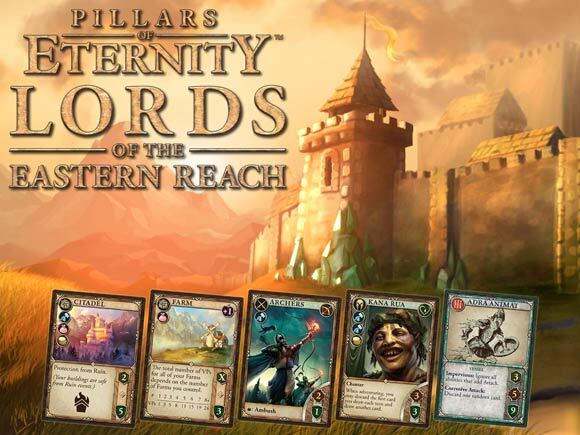 A quick note to let everyone know the Pillars of Eternity card game is in its last 24 hours. They've opened up 13 Stretch goals adding 82 more cards, solo rules, a wooden Pigeeple of the Spectral Pig, better cards, bigger dice, and are coming up on adding the Chanter troop type to the game. Plus, they just added a Campaign Book for people to be able to play through a whole series of scenarios that tell a story. Check it out, and if it looks cool the guys at ZRG would be very appreciative of your backing. We have good news for everyone that has a DVD backer copy of the game, but would like the latest 1.06 update. You can now head over to our Backer Portal to download an update to the latest version of the game. Updates and installation instructions for all three OSes are on the page. When a new update is released in the future, we will add the new patches in this location. Yeah, well... it feels like we should do something more significant with update 100, ya know? That being said, Kickstarter will label this as 100 automatically. Nothing I can do to change that. Interesting.. White March Quests is a stretch goal and the game is estimated to ship early 2016 so we should see the (whole?) expansion prior to that date otherwise that'd potentially spoil the contents of the White March expansion. The campaign has been fun, it's doing really well in the final days. Those guys and girls worked hard and made it happen. I bumped my pledge last night because $40 is a good price for all those autographs. Obviously Update #100 will be the release date for The White March, yes? Thanks in advance.